Among adolescent females ages 15 to 19, abortion rates increased during the 1970s, stabilized during the 1980s at around 43 abortions per 1,000 adolescent females, and then decreased steadily to about 11 per 1,000 by 2013. In 2013, the abortion rate for teens under age 151 was 2 per 1,000, lower than the rates for teens ages 15 to 17 and ages 18 and 19 (5.5 and 18.0 per 1,000, respectively). In 2013, the abortion rate was 27 per 1,000 black females ages 15 to 19, compared with 7 per 1,000 among non-Hispanic white adolescent females and 10 per 1,000 among Hispanic adolescent females. However, the gaps between the rates for black teens and those of the other racial/ethnic groups have been narrowing. Government estimates indicate that teen abortion rates increased during the 1970s, stabilized during the 1980s at around 43 per 1,000 females ages 15 to 19, then decreased steadily to about 11 per 1,000 by 2013. Similar declines are evident for all age groups. Rates for non-Hispanic white, black, and Hispanic females have all fallen notably since the early 1990s, although declines started a bit later for Hispanic females (in 1993). As of 2013, abortion rates have decreased by 77 percent among non-Hispanic white teens, by 74 percent among Hispanic teens, and by 68 percent among black teens, since their respective peaks. Black teens report higher rates of abortion than their non-Hispanic white and Hispanic peers. In 2013, there were 27 abortions per 1,000 black females ages 15 to 19, compared with 7 for non-Hispanic white females and 10 per 1,000 Hispanic adolescent females. 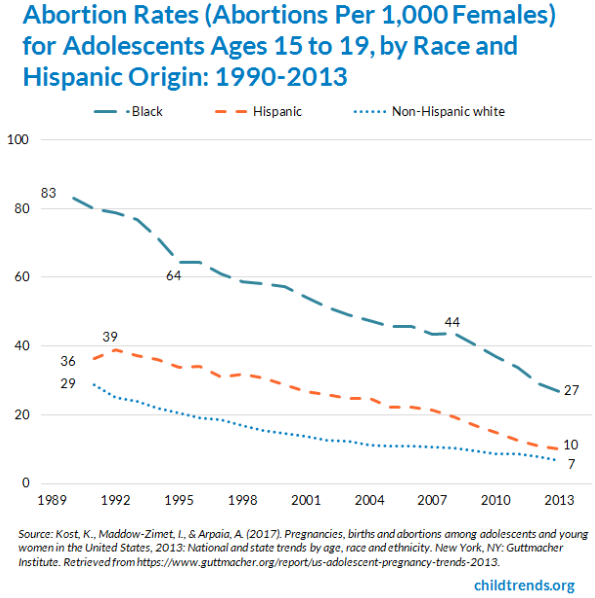 However, abortion rates among black adolescents have fallen further than rates for the other groups, so the gap has narrowed over time (Appendix 1). • Jatlaoui, T. C., Shah, J., Mandel, M. G., Krashin, J. W., Suchdev, D. B., et al. (2017). Abortion Surveillance — United States, 2014 [Tables 3 and 5]. Morbidity and Mortality Weekly Report 66(24). Retrieved from https://www.cdc.gov/mmwr/volumes/66/ss/ss6624a1.htm?s_cid=ss6624a1_w. • Kost, K., Maddow-Zimet, I., & Arpaia, A. (2017). Pregnancies, births and abortions among adolescents and young women in the United States, 2013: National and state trends by age, race and ethnicity. New York, NY: Guttmacher Institute. Retrieved from https://www.guttmacher.org/report/us-adolescent-pregnancy-trends-2013. International estimates for select countries are available from Sedgh, G., Finer, L. B., Bankole, A., Eilers, M. A., & Singh, S. (2015). Adolescent pregnancy, birth, and abortion rates across countries: Levels and recent trends. Journal of Adolescent Health, 56(2), 223–230. Select regional estimates are available from Singh, S., Remez, L., Sedgh, G., Kwok, L., & Onda, T. (2018). Abortion worldwide 2017: Uneven progress and unequal access. New York, NY: Guttmacher Institute. Retrieved from https://www.guttmacher.org/report/abortion-worldwide-2017. • Race/Hispanic origin data, except for 15- to 19-year-olds: Curtin, S. C., Abma, J. C., Ventura, S. J., & Henshaw, S. K. (2013). Pregnancy rates for U.S. women continue to drop (NCHS Data Brief No. 136). Hyattsville, MD: U.S. Department of Health and Human Services, Centers for Disease Control and Prevention, National Center for Health Statistics. Retrieved from http://www.cdc.gov/nchs/data/databriefs/db136.pdf. • All other data: Kost, K., Maddow-Zimet, I., & Arpaia, A. (2017). Pregnancies, births and abortions among adolescents and young women in the United States, 2013: National and state trends by age, race and ethnicity. New York, NY: Guttmacher Institute. Retrieved from https://www.guttmacher.org/report/us-adolescent-pregnancy-trends-2013. Guttmacher Abortion Provider Surveys from the Guttmacher Institute. Abortion rates are calculated by dividing the number of reported abortions by the appropriate female population (in thousands). For example, among adolescent females ages 15 to 19, the rate is calculated by dividing the number of abortions to females ages 15 to 19 by the number of females ages 15 to 19 in the population (in thousands). For adolescent females under age 15, the rate is calculated by dividing the number of abortions by the total population of females age 14. Data on abortions are collected from surveys administered to abortion providers. Child Trends. (2018). Teen Abortion. Retrieved from https://www.childtrends.org/indicators/teen-abortions. 1. Rates are calculated as the number of abortions experienced by women ages 14 and younger divided by the female population at age 14. The denominator is limited to 14‐year‐olds because the majority of all pregnancies among women ages 14 and younger occur among 14‐year‐olds. 2. Kost, K., Maddow-Zimet, I., & Arpaia, A. (2017). Pregnancies, births and abortions among adolescents and young women in the United States, 2013: National and state trends by age, race and ethnicity. New York, NY: Guttmacher Institute. Retrieved from https://www.guttmacher.org/report/us-adolescent-pregnancy-trends-2013. 3. Kost, K., Maddow-Zimet, I., & Arpaia, A. (2017). Op. cit. 4. Hispanic teens may be of any race.